After an hour of trudging in silence, they saw a distant line of trees and sighed with relief. They would find water. The landscape had become a furnace as mid-day approached and they had sweated from their exertion, but soon a breeze sprang up quite suddenly to dissipate the heat. It helped to cool them as it dried the sweat on their arms. They tramped on and at last came to a broad tributary, which had burst its banks during the night and was now almost dry. On the opposite side of the river, downstream, was an extensive bed of very tall reeds. The bed was four or five times the size of a football field. The river had torn reeds growing close to the edges from the sand, and swept them downstream to form jumbled and matted piles as high as their heads. Half-drowned brambles growing on the near side of the river hid some of the reed bed from the sight of the children. They dipped their cupped hands into the water and drank. Making wry faces, each of the children drank only as much as was necessary, while others kept alert to the presence of wild beasts. Following Daniel’s lead, the group climbed the bank and walked a little way downstream to come out opposite the reed beds, which were swaying and rustling in the breeze. They clambered onto a ledge of rock and slid down a steep bank of earth to drop into the water below. To their relief it only came to their knees. During the worst of the storm, it seemed to have been at head height. “The main river should’ve gone down a lot by now. I mean, look how this stream has gone down,” said Daniel. “Yes, if only smarty here hadn’t been so stupid,” replied Daniel, dismissing John with a sneer and wave of the hand. John was pale with fury. I should have expected that, he thought. Of course, I should have thought about the river before we left camp. I didn’t, so I suppose the big oaf’s right. Then, he was the one who … oh, what’s the use! Now he wants to be leader. The children were sheltered from the wind but, across the broad expanse of shallow water, gusts had begun to sweep the tall reeds. There was a constant rustle and chafing as the stems brushed back and forth in the wind. The children entered the bed. They moved cautiously. There was now also the muffled sound of large bodies moving amidst the stems; but the sound was too indistinct to determine what was causing it. “It can only be buffalo or elephants,” said Siyabonga, his hands cupped over his ears. Before anyone could stop him, Daniel splashed across a shallow furrow and penetrated further into the swaying reeds to move onto a sodden game path rich with the spoor of antelope that had used it after the flood subsided. “Daniel! Wait!” shouted John and Siyabonga almost as one, but their voices were lost in the stiff breeze. Daniel ignored them. Whistling now, he followed the path. He was beginning to enjoy himself; relishing the role of leader. The two shouted again. Again, Daniel ignored them. Lashing out with his stick at the swaying reed stems on either side, he thrust his way forward. Then, the reed bed exploded. A huge grey bulk rose suddenly above them, crunching reeds underfoot as it tried to make out the position of the intruders amongst the long stems. Ears as big as car doors swung back and forward, as their owners tried to focus their hearing. Elephants! Now there came a shrill blast of sound! Trunks lifted in the air as the herd tested the breeze for the scent of the children. There was a mighty smashing and trampling of the reed bed as the great animals shifted position, uncertain of the direction from which they were threatened. He turned to face the pursuing beast, only to find that it had turned from its pursuit to go after Siyabonga, who was some way up-river and making for a large boulder. Siyabonga gained the shelter of the rock and dodged behind it. He crouched there in waist-deep water, his chest drawing in great gulps of air. The elephant gave up its pursuit and returned, screaming shrilly, to the herd. John splashed through the shallows to join Siyabonga and the two crouched side by side, peering at the massive grey shapes wheeling and crashing through the reeds. Siyabonga stood up, peering towards the reeds. “John, I thought Tandi had got back,” he yelled. Siyabonga cried out as if in pain. He bent down and John could see him groping on the bottom for some of the smooth stones that lay embedded there. “I’m going to get Tandi,” said Siyabonga grimly, as he started to wade towards the reed bed. “Don’t be a fool,” yelled John, feeling himself rising as if in a trance, heart pounding, to follow Siyabonga. “You can’t take on a herd of elephants!” He groped for rocks and started to edge forward in Siyabonga’s wake. Siyabonga splashed to the middle of the stream, and with a long throw bounced a rock off the hindquarters of one of the blundering animals. It swung around at the irritation and moved towards the river’s edge, seeking the cause of its discomfort, and then plunged back into the reeds. Again, Siyabonga threw a stone. Again he connected. John found himself joining in the futile assault, yelling as he went. The boys were now close to the reeds, shouting and tormenting the big beasts to try to make them give way. At that moment a large cow, leader of the herd, saw them and trumpeted. With her trunk curled under her massive head and ears folded back, she charged, sending scatters of spray across the shallows as she came. The boys turned and ran. They churned through the shallow water with great bounds, their pebbles discarded as they sped. John reached the boulder a moment before Siyabonga, and dived behind it. Siyabonga followed with a great surge of water as he tripped and fell headlong behind the rock. The boys crouched low, clutching each other and frozen with fear, not daring to raise their heads. Above them, the cow stood screaming, swaying, and shifting its weight, its little eyes peering to catch a sign of movement near the rock. Behind them on the steep bank, Claire stood transformed as she dared the very edge, waving a dry branch and shouting to attract the attention of the angry cow. It was enough provocation to enrage the matriarch further, and the beast moved from the rock to confront her. It tried to climb the bank, placing its massive front pads on the yielding earth and attempting to heave itself up. All the while, it squealed with rage. Claire stood her ground, screaming with excitement and terror and waving her small branch in the air. In her panic, she teetered on the rim and nearly plunged down the slope. Daniel crouched, several paces behind, close to the trunks of two large trees. From their shelter, he also began to wave his stick, shouting. The cow stood for some time in the water at the base of the bank, seeking their scent with her trunk and peering up at the girl, frustrated at not being able to mount the bank. Growing weary, and having lost sight of the boys in the water, she wheeled and strode back to the reed bed, moved through the milling herd and continued up the incline on the other side. One after the other, the rest of the herd followed her. The children caught a glimpse of them retreating through the rank vegetation that lined the river bank. They made out two calves a metre tall amongst the big animals. Their mothers were close by, rumbling reassurance to the two little ones despite the fracas. Soon the herd was gone. The reed bed looked devastated, with great swathes of reeds crushed underfoot as the herd blundered through it. Here and there, islands of reeds stood intact, their tips swaying in the breeze. Karel joined the group. He had scrambled up the bank further down-river, he said, and got onto high ground from where he could see the unfolding events. He could not give any information about Tandi. No one could offer Siyabonga any words of comfort. John had seen Tandi run to his left as a cow advanced on them and, pursued by the animal, flee deeper into the reeds. The place to which she had fled looked devastated. The four children edged across the river, dreading what they might find. There, lying in a mess of trampled reeds was a mud-spattered clump of red material. John could make out a sleeve of his anorak that he had put around Tandi when the first rain fell. He picked up the pathetic remnant. 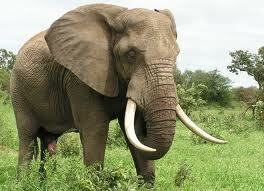 An elephant’s tusk had torn it from the jacket and trampled it to mush. Where was Tandi’s body, he wondered? The elephants would probably have crushed her. Claire started to sob quietly. Siyabonga looked grim. With a cry of distress, Siyabonga ran forward, and sank to his knees, tearing away the scatter of reeds. He held the remains of a red anorak. John sank to his knees, not able to speak. Then, from beneath the half-buried trunk of a dead tree, they heard a plaintive voice. Overjoyed, Siyabonga ran to help his younger sister from her refuge, pulling her to her feet and reassuring her. Claire ran up excitedly and hugged the little girl. All around the gnarled trunk were the deeply embedded footprints of the herd, and the mounds of dung they had dropped as they milled about in their confusion and anger. Breathing hard and exhausted from their ordeal, the children sat down to recover. There was a feeling of relief that no one had suffered injury. Claire wiped her tear-grimed face and held Tandi’s hand as they rested, all talking at once. When they had calmed, John and Siyabonga spoke to Claire. “You weren’t bad, Claire … for a girl,” John said. “For a girl? What do you mean, ‘for a girl’?” responded Claire indignantly. “You? You nearly got Tandi killed, that’s what you did!” said John. Daniel got slowly to his feet, his eyes sparkling with anger. His face flushed, he strode over to where John sat and towered over him, his big fists clenched and the veins swelling in his neck. “You’ll have to deal with me too,” said Siyabonga with quiet anger, his heart pounding in his throat as he moved to stand beside John. Daniel stood there huge and menacing, a little muscle twitching near the corner of his right eye. He glared down at John. John stood up, his hands involuntarily coming up beneath his chin to take guard. Daniel swung sharply on his heel and stalked off to throw himself down under a tree, cursing, brooding, and sulky. Karel just shrugged, and the tension passed. While Claire and Tandi told each other about their experiences and Daniel sat in angry silence, John spoke to Siyabonga. Both boys felt the surge of a new confidence. “You were pretty good out there,” said John. The two stood silent for a time.